An ‘On Screen Kiosk Display’ is a permanent display that refreshes automatically. For example, the display may show a list of sales orders that are waiting to be shipped, a list of items that are to be manufactured, a running total of the daily sales values versus the daily target or it may be a simple display of the available stock at a nominated warehouse and location. 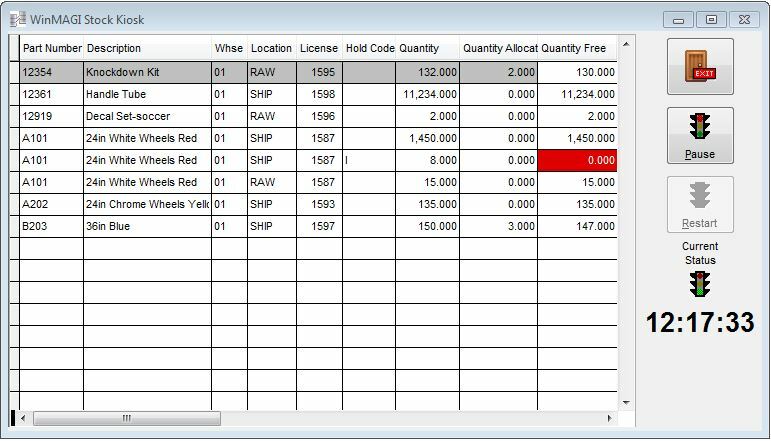 As the orders are assigned to staff, the items manufactured and the value of the entered sales orders increases, the display can show who is processing the order, what stage they are at, how sales are progressing against daily targets and the current stock availability. If the stock quantity of an item dips below a critical level, the staff can quickly see that the stock levels needs to be refreshed. The Kiosk Display can be tailored to suit your needs. Multiple Kiosk displays may also be ‘daisy chained’. For example, the first kiosk display may show the sales orders waiting to be shipped, the second iteration of the Kiosk displays the items to be manufactured and the third iteration shows the stock levels. After the stock levels have been displayed, the Kiosk display returns back to the sales orders waiting to be shipped. Any number of kiosks may be displayed in a revolving sequence. The Kiosk(s) would typically be displayed to a monitor positioned in a prominent position within the warehouse (or office) so that staff (or customers) can easily see the information being displayed. With a Kiosk display, everybody can literally be ‘on the same page’.